When you are building an email marketing list, you own it, this is your list. You no longer have to depend on a platform like Facebook, that's why I strongly recommend marketers to build your own list. 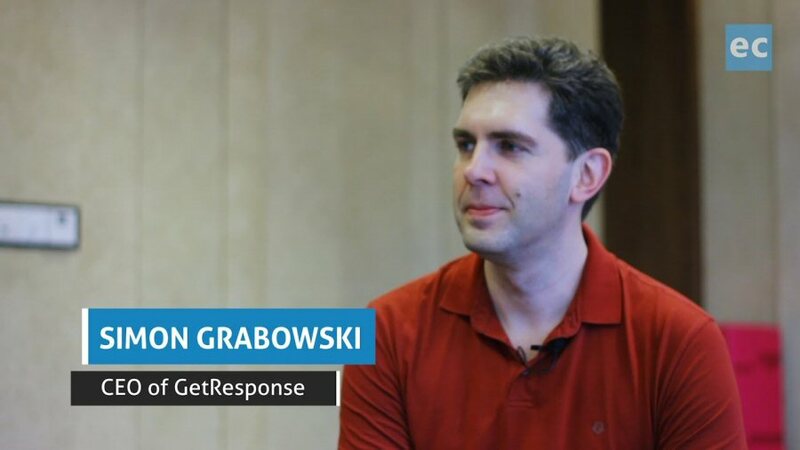 During the recent ResponseCon, we have the pleasure to interview Simon Grabowski, who is the CEO of GetResponse. In 1997 he started GetResponse Email Marketing with only $200 in his pocket. Today, he is the owner of several online businesses that serve a growing network of over 23.6 million people. We have summarized the interview highlights here so read on, or you can watch the full video of our interview with Simon at the bottom of this article, or on our YouTube channel. When and how did you start GetResponse? When I was 16 years old during 1996, I started Travel Poland, a website for users to look-up hotels in Poland. I discovered during that time that one of the challenges was to send out emails to the hotels in order to promote our services. I was wondering back then, that it would be great to have a system to do this. Even though I was a terrible programmer, I started coding and I did it. With this simple solutions, I started thinking of the possibility of offering this system to other customers. Wow, 16 years old is an early age to start entrepreneurship, how did it happen? I always wanted to do something when I was young. We have this tradition that families in Poland are giving cash or gifts to 10 years old. I got a dot matrix printer back then as a gift, so I used this printer to do some sort of newsletter for my street (like a blog). I printed some copies and tried to sell it, but not many would buy. That is when I realized, how cool will it be if I can create a product and sell. You are in the global competition, how does GetResponse line-up against competitors like MailChimp? From the beginning, we always have competitors and I would say it is stimulating to have competitors, motivating you to become even better. People will tend to compare us with competitors like MailChimp, they are kinda like a "Big Mac" for me, we have a lot of customers coming from MailChimp who were happy with them earlier, but they decided they need more so they come to us for email marketing, for more advanced marketing automation, 24/7 human-operated customer service. In short, we have a comprehensive platform not limited to just email marketing and marketing automation. We have landing pages creator plus online webinar which is a great combination to drive engagement and grow subscribers. Isn't that the features can be copied by your competitors, how do you stay ahead? Yes, everything can be copied. We just have to continue pressing on. We work with our customers closely to provide them with features that others don't have. The notion of having all-in-one platform great for small businesses and the enterprise customers is crucial. They just don't need to purchase other services like GoToMeeting, with everything available in GetResponse. The hot topic now is AI, is GetResponse working on AI initiatives? In 2014, we launched our first AI initiative: Hydra, which is an AI-driven anti-spam system. We analyze all the data we have with machine-learning and big data processes, which enables us to predict, for instance, the intention of spam. Spam is the biggest enemy of email marketing and we don't want users to use your system for spam, this will just create a lot of problems for everybody. Before AI, we were using a reactive system which we can only react if certain users are sending out abusive emails, and talk to them to shut down the accounts. AI like Hydra enables us to be proactive instead of being reactive. Hydra has completely changed the game for us. For example, if a user uploads a list of 10,000 emails to our system, Hydra will analyze the data from all angles to determine whether the list is clean, whether the user is a spammer or fake user. With the emerging of social media, is it a threat to email marketing? It is never a debate on social media "or" email marketing. Social media does not replace email marketing, they compliment each other and they work great together like a marriage. When social media is growing, people are predicting email is going to die. While they have been saying this for the last 10-20 years, we are still alive and kicking! In fact, there is a lot of growth in email marketing and if we refer to the latest statistics, there is a 20% increase of email sent last year (in the whole world). What is your view on duopoly by Google and Facebook? Fundamentally, you can't avoid Google and Facebook if you are a marketer, it is a hard one to tackle due to the sheer dominance so you just need to embrace it. To be honest, any business that models itself around a specific platform is asking for trouble. If you are building your entire business model on Google or Facebook algorithm, you are essentially betting, taking a gamble. Your business has to defend itself, you have to be able to market your business via multiple channels including email marketing. Also, using Facebook ads is kinda like renting a list, that's what it is. When you are building an email marketing list, you own it, this is your list. You no longer have to depend on a platform like Facebook, that's why I strongly recommend marketers to build your own list. Sign-up for a GetResponse email marketing account and start building your own list now! Watch the full video of our interview with Simon Grabowski below, or on our YouTube channel.